As new services and business models are being associated with the power distribution network, it becomes of great importance to include load uncertainty in predictive computational tools. In this paper, an efficient uncertainty-aware load flow analysis is described which relies on generalized polynomial chaos and stochastic testing methods. 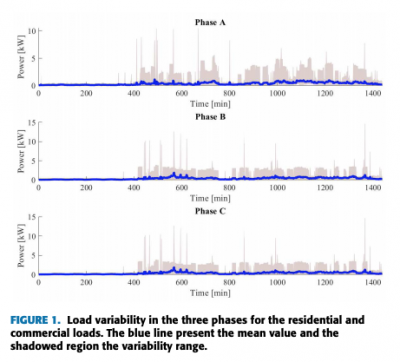 It is described how the method can be implemented in order to account for real data-based load profiles due to two different usage models: residential loads and electrical vehicle charging profiles. Hence, it is shown how some relevant information affecting the quality of service can be deduced by means of non-elementary post-processing computations. The proposed technique is tested by using a benchmark scenario for typical European low voltage networks, considering the variation of both residential loads and EV charging profiles. The results are compared with the same simulation done by means of the Monte Carlo methodology. The consideration done during the analysis will be useful to clarify the application of the methodology but also to understand the effect of load variations on the grid characteristic quantities.